This card is for C4C42 at Crazy for Challenges and SCF8, Speedy the Cat's Friends #8. This is an 11 x 4.25 and opens from left to right. Instead of cutting the cardstock width wise it was cut length wise. 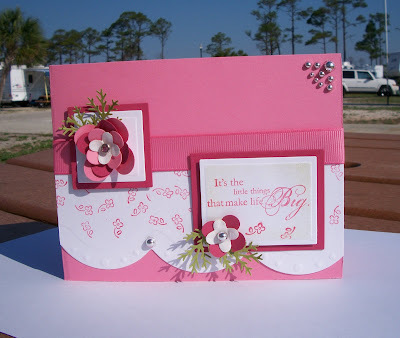 The challenge at Crazy for Challenges is to use paper flowers, any way or any kind, and the challenge at Mark's Finest Papers is to use embossing on your card. My flowers is an SU die, Floral Fusion, layered over one another. I LOVE this little die. I really like how it accompanies Martha Stewart's leaf punch so well. Of course, that little leaf just goes with everything. It is my go-to leaf punch. All cardstock is Stampin Up. Before layering the larger flower together, I pressed each little bud with an eraser top into the palm of my hand to give it some shape. A hole was punched in the center of the larger flower and a small Pink Ice Crystal Brad (SU) held it together. The small bud was shaped the same but used only two little flowers and a silver self adhesive half pearl. A couple of Old Olive leaves were placed behind the flower and attached with a glue dot. There's no reason to use dimensionals as the flowers themselves raise up nicely. The greeting is from one of my favorite SU sets, Happy Harmony, and was stamped in Rose Red on white. This was then cut out using a rectangle Nestabilitie and embossed. The tiny flowers were stamped at the bottom and is from a retired SU set of cute little backgrounds. I think it makes the sweetest accent to a card...sorry, I don't recall the name of that set. The edges were sponged lightly with Old Olive. The flower was attached and this piece was raised with foam adhesive and placed on Rose Red cardstock. The larger floral piece was not sponged with Old Olive. This white embossed square Nestabilitie was placed on top of a Rose Red piece then adhered on the ribbon (no foam adhesive was used). The base card is Regal Rose. A piece of white was die cut and embossed using the Jumbo Scallop Border Petite Spellbinder die. The little floral background was stamped in Rose Red. Another (same size) silver self adhesive half pearl was placed in the curve of the cut. A piece of Regal Rose ribbon was wrapped around the card and additional silver half pearls were added in the top right corner. Let me know if you like this one and what you think. Thanks! I love the colors and the punches ... the flower is really pretty too. VERy sweet indeed. You have me wanting to go out and buy more punches ... Those silver half pearls really add a nice elegant touch. Love the colors and pretty punched flowers on this! thanks for playing with Speedy this week! Robbie - this is so pretty in pink! Love those flowers~ Thanks for playing with Speedy's Friends! This is so beautiful!! I love the Regal Rose, your layout and overall design. Thanks for playing in Speedy's Frinds challenge! Very pretty and cheerful! Thanks for joining us at Speedy's Friends. thanks for playing speedy cat's friends challenge!